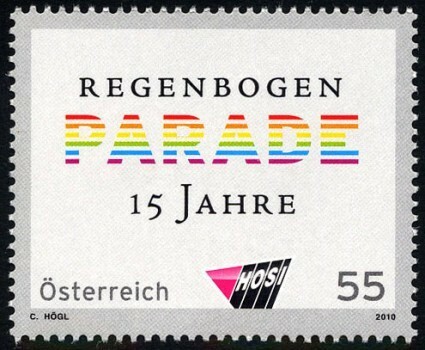 Austria will issue a commemorative stamp for the 15th Rainbow Parade in Vienna on July 3. Said Jona Solomon, co-president of Homosexuelle Initiative (HOSI) Wien, Austria’s oldest and leading gay and lesbian organization: "To our knowledge this is the first time in the world that a postal authority is issuing a special stamp on a gay/lesbian occasion. At least, we are not aware that this has happened before anywhere in the world." Can any of you readers think of another? UK Gay News reports: "The special stamp was designed by Christian Högl, who works as a professional graphic designer in addition to his volunteer activities as HOSI Wien’s co-president. He also created the graphic designs for the Rainbow Parade for the last eight years." The stamp is one of 60 to be issued this year by Austria Post. A campaign has been underway in the U.S. for some time to honor gay rights pioneer Harvey Milk with his own stamp.